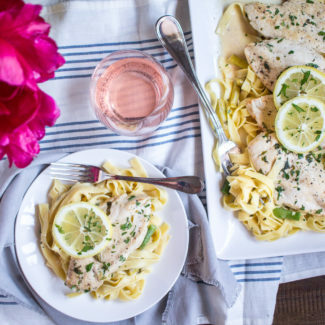 Your weeknight dinners just got easier. 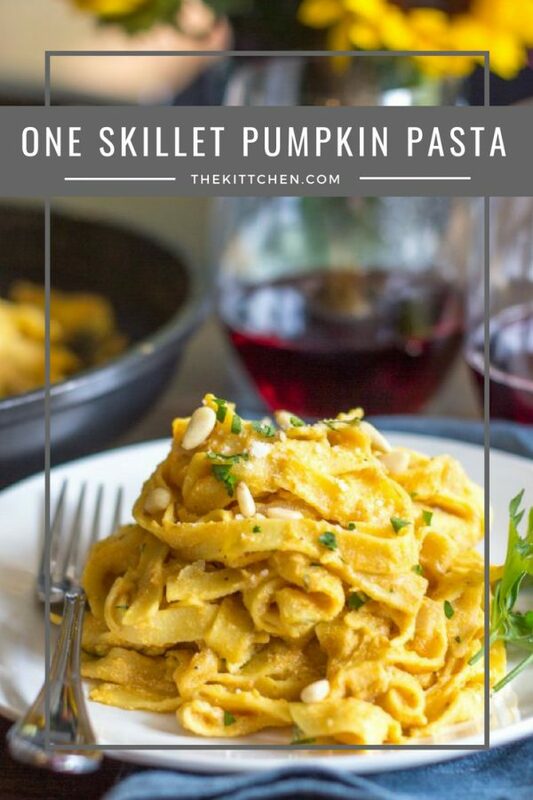 This One Skillet Pumpkin Pasta can be made in just twenty minutes and it barely makes a mess in the kitchen! 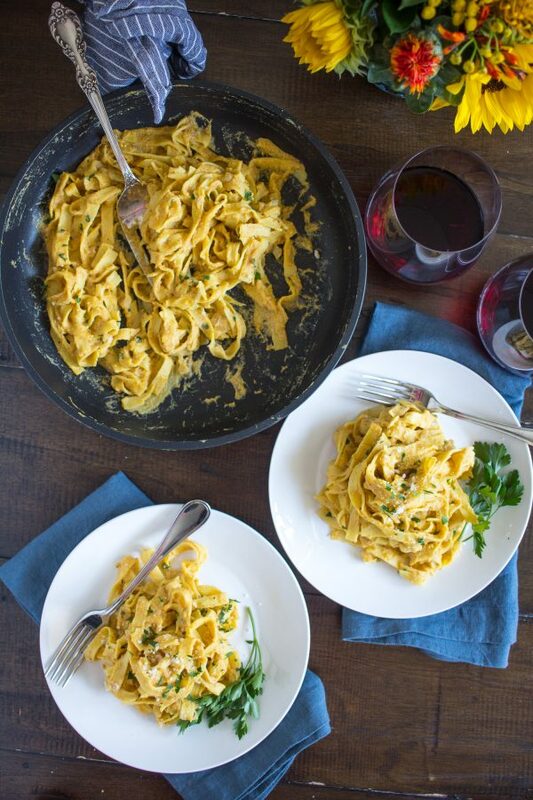 Fresh pasta is served in a creamy pumpkin sauce seasoned with shallots, nutmeg, and Parmesan. 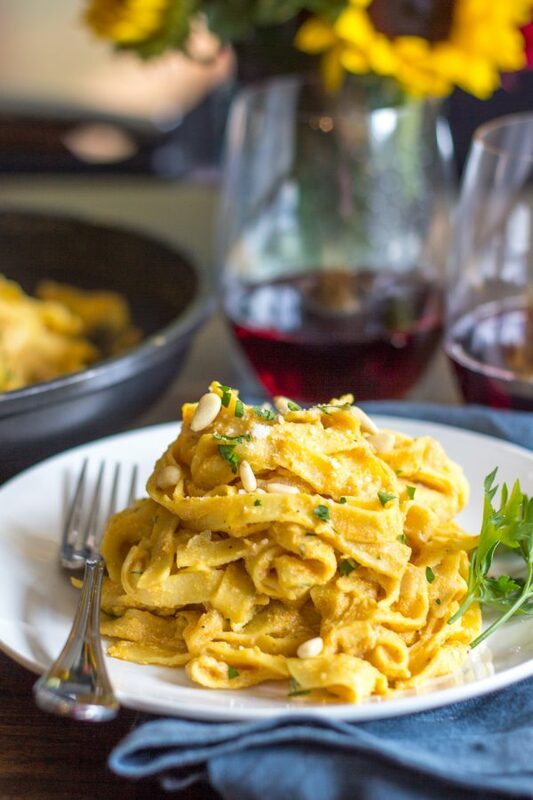 It is topped with fresh parsley and pine nuts which give the meal a boost of fresh flavor and a touch of crunch. 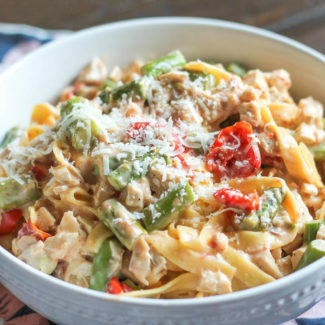 It is a meal loaded with fall flavors that comes together quickly and easily. 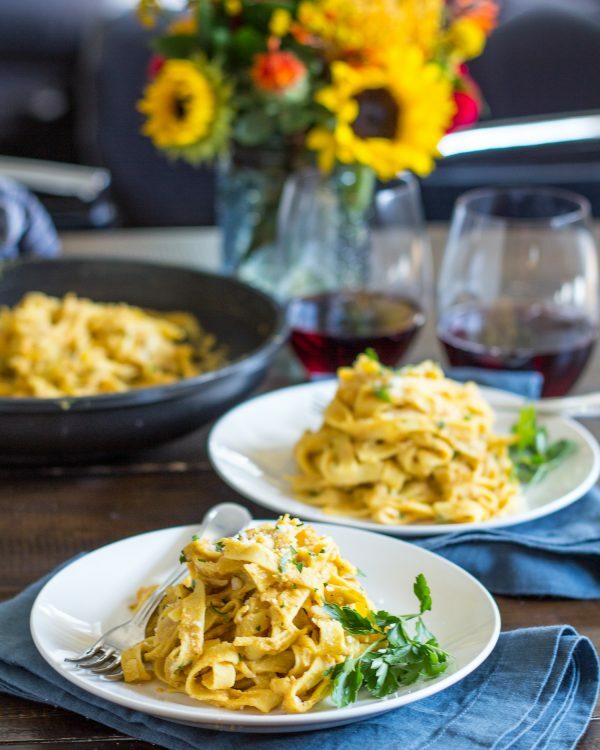 This One Skillet Pumpkin Pasta starts with sauteing chopped shallots in butter until they are lightly browned and almost caramelized. Then you add canned pumpkin, vegetable broth, Parmesan, fat free half and half. 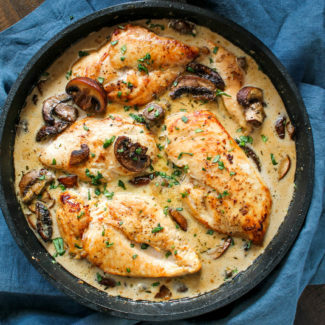 The sauce is seasoned with salt, pepper, and a touch of nutmeg and brought to a simmer. Then you add fresh pasta and cook for 3 minutes. 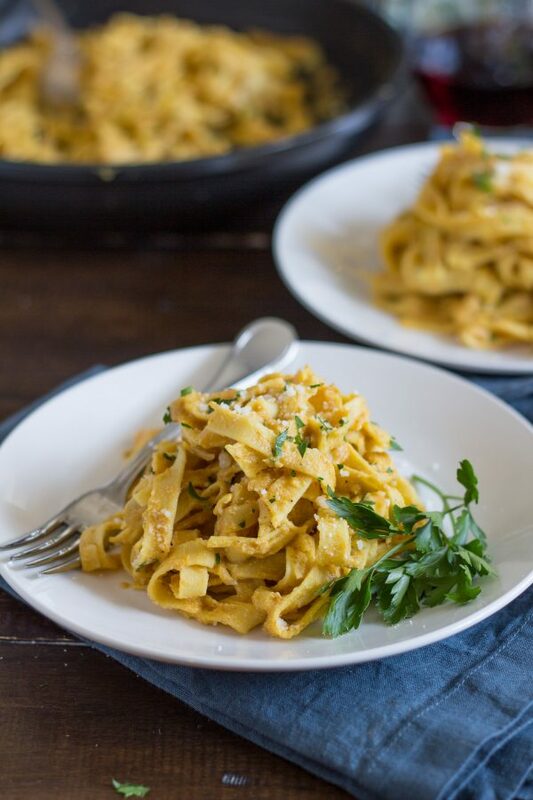 Garnish with pine nuts and parsley and you are done! 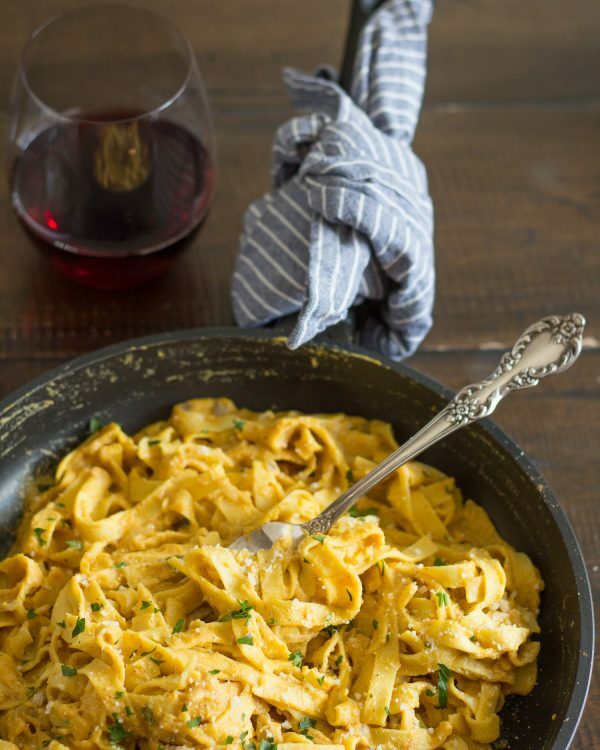 The pumpkin sauce has a nice pumpkin flavor that is balanced out by the Parmesan and other ingredients. It tastes like pumpkin without the flavor being overwhelming. The sauce does get pretty thick. If you want to thin it out, just add some extra vegetable broth. I used fat free half and half instead of cream. 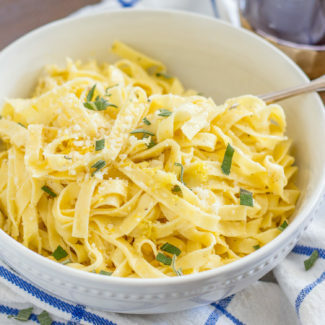 It still gives the pasta a creaminess, but without all of the extra fat. The fat free half and half isn’t as thick as cream, but it works will in this recipe since the pumpkin needs to be thinned out. You do need to make sure you add enough salt and pepper to the sauce, without it, this pasta doesn’t taste like much. I added salt and pepper bit by bit until the sauce had just the right amount. I always recommend adding salt and pepper a little at a time and taste testing as you go. The exact amount of salt and pepper you want in a dish comes down to personal preference, so taste testing is important. 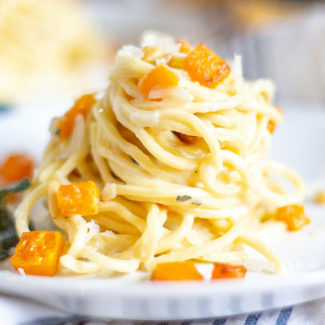 If you don’t mind dirtying another dish, this pasta would be wonderful with fried sage on top. If you add the sage, I would add it instead of the parsley. Melt the butter in a skillet over medium heat. Once melted, add the shallots and season with salt and pepper. Saute the shallots until they reach a light brown color, stirring frequently. Stir in the vegetable broth, half and half, pumpkin, parmesan, and nutmeg. Season with salt and pepper to taste. Bring to a simmer, then add the pasta. Stir to coat the pasta in the sauce. 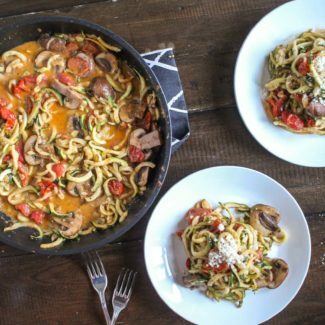 Simmer the pasta in the sauce for three minutes, or until al dente. Sprinkle the pine nuts and parsley over the pasta and serve.